If you have a surface that needs a pop of color and ribbons of golden shimmer, look no further than our Aventurine Glass Tile; this series is characterized by its rich, earth-to-sky toned colors and the gold-hued dust that shines and weaves randomly throughout each tile making it a standout choice for pools, kitchen back splashes, wall tiles and more. 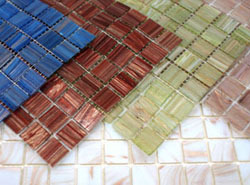 Hakatai also offers this glass tile line in mesh-backed sheets and loose tile, making the applications almost endless. Artists and crafters can utilize these bold, beautiful colors on sculptures, mosaic stepping stones in the garden, bird baths, drink coasters, school projects, community art murals, the list goes on…wherever your imagination goes, these glass tiles can go with you and bring your concepts into a gorgeous reality.